Comment: Did former Maldives leader receive a fair trial? This comment piece by Toby Cadman was first published on Al-Jazeera. Republished with permission. Cadman is an international lawyer and is currently advising the government of the Republic of Maldives on legal and constitutional reform. In particular, he is assisting the government in responding to the allegations made to the UN by former President Mohamed Nasheed concerning his conviction for an offence of terrorism. On March 13, the former president of the Republic of Maldives, Mohamed Nasheed, was convicted of terrorism. He was sentenced to 13 years imprisonment for ordering the army to arrest and detain the Chief Judge of the Criminal Court Abdullah Mohamed. It was alleged that Abdullah was abducted by the army without any lawful order, held incommunicado for 72 hours, and then detained for a further 21 days in a military establishment. There was national and international outcry at such an unprecedented attack on the judiciary, including statements from the United Nations terming the detention of the judge as arbitrary and in breach of international law. It has been argued that Nasheed’s actions don’t qualify as terrorist acts. However, if similar actions had been conducted in the United Kingdom, the former president could have been charged with kidnapping and false imprisonment – an offence which carries a maximum penalty of life imprisonment. Regardless of whether or not he was at one point a head of state, all persons – irrespective of political office or other affiliation – should be brought to justice where there is credible evidence to demonstrate that a criminal offence has been committed. Mohamed Nasheed was elected as president in 2008. While in office, political turmoil erupted. It is believed that he ordered the locking-up of the Supreme Court and ordered Judge Abdullah to be placed under arrest by the army. Nasheed resigned live on national television, but less than 24 hours later, alleged that he had resigned under duress. An independent inquiry carried out by the Commonwealth, and observed by the UN, concluded that he had resigned voluntarily and that the transfer of power was lawful and constitutional. Therefore, his fall from power cannot be characterised as a coup. During the former president’s trial, it was alleged that he had ordered the the abduction of a senior judge to prevent him from carrying out his judicial function. In a BBC Hardtalk interview after his resignation, Nasheed stated in very clear terms that the judge had to be removed and that as president, in the absence of anyone else acting, he had to do it. The judge, in the former president’s words, was becoming a nuisance. The targeting of the judiciary in such a way by the Executive cannot be accepted in any democracy and such an attack can only be construed as an attack on the constitution. It has been argued by the former president and his legal team that there were significant flaws during his terrorism trial and that, as a result, his detention is arbitrary and in breach of international law. However, rather than appeal the verdict, his legal team filed a communication with the UN Working Group on Arbitrary Detention. The government has been given until July 11 to respond to the allegations and a decision is expected in September. The former president is arguing that arrest was unlawful, his trial rushed, and the composition of the panel of judges lacked the requisite independence and impartiality. There have also been allegations that the conditions of his detention breach his human rights. Ordinarily, many of these matters would be subject to legal challenge through the national courts. However, the former president has elected not to appeal. Contrary to statements issued to date, it is the government’s position that the former president has not been prevented from appealing – he has chosen not to do so. It is clear that in a politically charged case such as this, the media reporting can take a sensationalist and selective approach. It is essential that what is reported is accurate and balanced as the stakes are extremely high. Much has been made of the fact that Maldivian legislation was amended so as to reduce the time period for the lodging of an appeal from 90 to 10 days, thus alleging that Nasheed has been prevented from appealing. He has not. The Maldivian authorities have repeatedly maintained that the former president is still able to submit an application for appeal and that it will be for the courts to consider. It is also important to note that the deadline for submitting an appeal within 10 days relates to a notice of appeal, not the full appeal. It has been further alleged that the former president has been prevented from appealing through the court’s wilfully withholding of documents which are necessary for filing an appeal notice. However, the court records will clearly demonstrate that the judgement of the court and the trial record was provided to the former president and his legal team. He refused to sign the court record. Notwithstanding this refusal and the expiration of the 10-day deadline, there is a provision in the law for a defendant to submit a late appeal if the delay has been caused by the authorities. Furthermore, there is a provision in the law for the courts to accept a late appeal “in the interests of justice”. The conditions the former president was purportedly being forced to endure have been called into question. Again, these accusations of unfair or unlawful treatment are wholly false. He was held, up until his recent release on house arrest, away from the general population. However, he is not and has never been in solitary confinement, and was detained in a facility that would not only meet international standards of practise, but arguably far exceed any acceptable level. As a former president, he is entitled to VIP treatment in custody, which he received up until his release under house arrest. There is an underlying risk underlining this entire court process – the potential of a trial by media. As with all cases, there are two sides to any argument, but the government’s position has not been given any attention and the offence for which the former president was convicted has been unnecessarily trivialized. There is a clear obligation on all, be it members of the media, or members of the international community, to acknowledge both positions in relation to any case, and not seek to favour one when the issue is yet to be fully considered and determined by the appropriate tribunal. Posted on July 10, 2015 July 10, 2015 Author Minivan NewsCategories Features & Comment, PoliticsTags maldives, maldives news, minivan news, Mohamed Nasheed, Omnia Strategy, terrorism, Toby Cadman7 Comments on Comment: Did former Maldives leader receive a fair trial? The Maldivian government, responding to the UN working group on arbitrary detention today, contended that a terrorism conviction against former president Mohamed Nasheed was not politically motivated and said allegations over lack of due process are factually incorrect. Nasheed’s family had lodged a petition with the UN in April requesting a judgment declaring the opposition leader’s detention illegal and arbitrary. The government was asked to respond before the first week of July. “Mr Nasheed has not been a victim of a politicised process. He has been properly charged and faced trial for an extremely serious offence, one that was aimed at interfering with an independent judiciary and circumventing the rule of law. 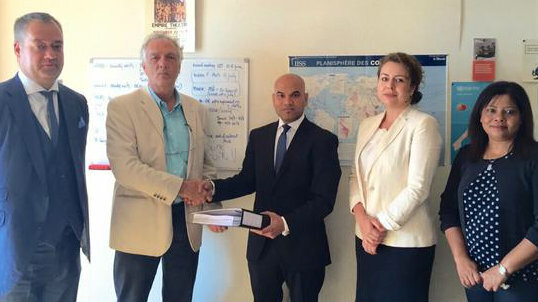 The law cannot be applied selectively,” said Ahmed Shiaan, the ambassador of the Maldives to Belgium. Nasheed was sentenced to 13 years in jail over the military’s detention of the criminal court chief judge Abdulla Mohamed in January 2012. Shiaan and Toby Cadman, a barrister and partner at London-based Omnia Strategy, delivered the response to the UN in Geneva today. The 19-day trial was criticized by foreign governments and UN rights experts. The UK Prime Minister David Cameron, the EU parliament and high profile US senators have called for his immediate release. Omnia Strategy, a London-based law firm chaired by Cherie Blair, the wife of former UK Prime Minister Tony Blair, was employed for an undisclosed fee to write the response. Nasheed was transferred to house arrest in late-June in exchange for opposition backing on a constitutional amendment that will allow President Abdulla Yameen to replace his deputy. Talks are now ongoing between the Nasheed’s Maldivian Democratic Party and the government. Speaking to the press in Geneva, Shiaan contended Nasheed’s petition to the UN was an attempt to divert attention from his “abduction” of a sitting criminal court judge. Nasheed’s lawyers have argued that the trial was rushed and that the criminal court had withheld trial records to block an appeal. Lawyers have also raised concern over the denial of legal counsel at some hearings. Shiaan, however, said the allegations are factually incorrect and a mischaracterization of reality. “We are confident they will dismiss the communication by the former president in its entirety,” he said. Cadman insisted Nasheed could still appeal his conviction at the High Court and denied that the criminal court had deliberately withheld trial records to block an appeal. Nasheed and his lawyers had refused to sign the records, he contended. Admitting that Nasheed was not given legal representation at the first trial, Cadman claimed the process was legal under Maldivian law. The former president’s lawyers had later boycotted hearings, he said and suggested Nasheed refused to make use of opportunities provided by the criminal court to appoint new counsel. Nasheed was brought to trial a day after his arrest. He wasn’t allowed legal counsel at first hearing with the criminal court saying it’s regulations requires three days to register lawyers for defendants. Nasheed’s lawyers later recused themselves claiming they could not mount a proper defense with the criminal court rushing the process. Hearings were often held late at night. The verdict was delivered at 11:15pm. But Cadman today insisted the trial was not rushed as no new evidence had been submitted against Nasheed. All the materials had been provided in 2012 when Nasheed was first charged with ordering an arbitrary detention of the judge. “The only difference was the qualification of the offence under national law,” Cadman argued. While the first offence only carries a few months in prison, the latter charges of terrorism carry at least ten years in prison. Nasheed’s lawyers argued they required more time to weigh the evidence in light of the harsher charges. The opposition leader contends the criminal court had blocked him from filing an appeal within the shortened 10-day appeal period. The new provisions, dictated by the Supreme Court shortly before Nasheed’s trial commenced, are silent on accepting late appeals, his lawyers have said. The appellate court, citing lateness, refused to accept an appeal of a murder acquittal filed by the Prosecutor General’s Office in June. The PG office told Minivan News the delay was caused by the criminal court’s failure to provide a record of trial proceedings within the 10-day appeal period. A ruling by the UN working group is expected in September or October, Nasheed’s lawyers have said. The main opposition Maldivian Democratic Party (MDP) has accused Omnia Strategy of lying over its role in advising President Abdulla Yameen’s administration. The UK-based law firm owned by Cherie Blair, the wife of former British prime minister Tony Blair, had said its work was limited to assisting the government in strengthening democracy. 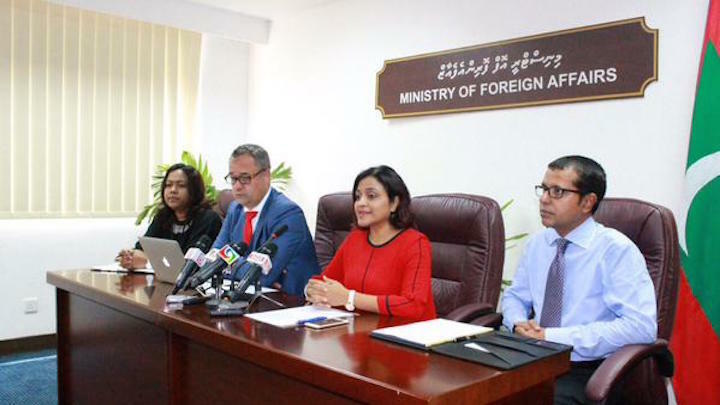 But the foreign ministry revealed yesterday that Omnia Strategy was assisting the government in preparing a response to a petition filed by former President Mohamed Nasheed at the UN working group on arbitrary detention. The company’s fees will be revealed when its work is complete, the foreign minister has said. The opposition leader’s international legal team is seeking a judgement declaring his imprisonment on terrorism charges arbitrary and unlawful. The government has been asked to respond before the first week of July. The MDP, in a statement yesterday, said that the contract with the law firm is “thought to be worth of millions of dollars” and noted Omnia had previously said it would not become involved in domestic politics. 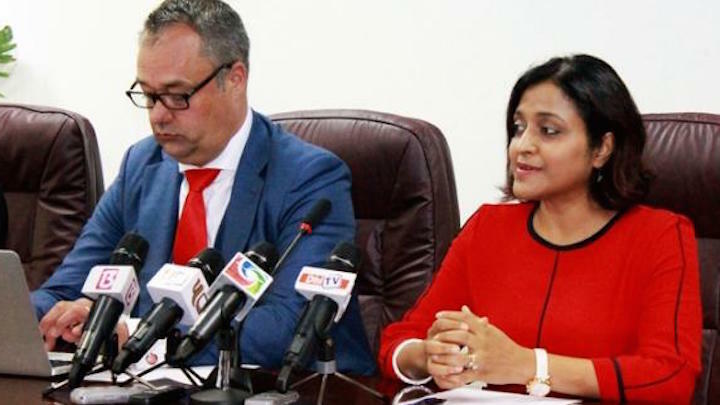 “But today, Omnia lawyer Toby Cadman appeared at a press conference in Malé alongside foreign minister Dunya Maumoon, where he revealed Omnia’s actual work involved responding to the claim submitted by President Nasheed to the UN working group on arbitrary detention,” the MDP said. The MDP said Cadman’s claim that Nasheed was guaranteed the right to legal counsel during his 19-day terrorism trial was “a shameless and brazen departure from the truth”. “They are taking possibly millions of dollars in exchange for helping a dictatorship keep a democracy hero in jail,” he said. Speaking to the press yesterday, Cadman said due process was followed in Nasheed’s trial and that the government has prepared its defence. The former president was sentenced to 13 years in prison over the military’s detention criminal court chief judge Abdulla Mohamed in January 2012. “If the offence had occurred in the United Kingdom the former President could have been charged with an offence of kidnapping or false imprisonment, an offence which carries a maximum penalty of life imprisonment,” said Cadman. “Throughout the legal proceedings against former President Nasheed, his constitutional right to effective legal representation has been guaranteed and when his legal representatives boycotted the proceedings, the former president was repeatedly reminded of his right to alternative legal representation”. 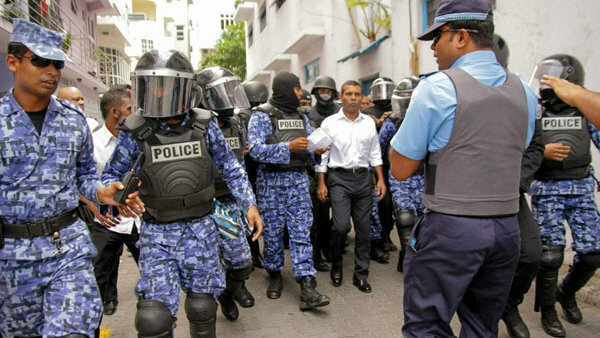 Nasheed’s conviction on terrorism charges after a 19-day trial was widely criticised over apparent lack of due process. International pressure on the government to release the former president and other “political prisoners” have been mounting in recent weeks. The European parliament and US Senators John McCain and Jack Reed have called for Nasheed’s immediate release. Briefing the press in Washington DC after filing the petition in late April, Nasheed’s lawyer Amal Clooney said the terrorism trial violated due process and compromised the basic guarantee of presumption of innocence. Amal said that the court had said that there was no need to call for defence witnesses because such witnesses “would not be able to refute the evidence submitted by the prosecution”. “This tells you everything you need to know about the process. Because why call a defense witness, if you already know that the verdict is going to be guilty,” she said. Following the government’s announcement that it has enlisted Omnia Strategy earlier this month, Nasheed’s MDP expressed “disgust” with the law firm’s decision to represent President Yameen’s administration. The former UK Attorney General Baroness Scotland, who sits on Omnia’s advisory council, was paid £125,000 for two weeks’ work in 2012, advising Mohamed Waheed Hassan, Nasheed’s deputy who had ousted him earlier that year. UK-based international law firm Omnia Strategy is providing legal advice to the government in responding to a petition filed by former President Mohamed Nasheed at the UN working group on arbitrary detention. The opposition leader’s international legal team is seeking a judgement declaring his imprisonment arbitrary and unlawful. The government has been asked to respond before the first week of July. The government previously said the law firm owned by Cherie Blair, the wife of former British prime minister Tony Blair, was hired to “advise on strengthening the legislative framework” for democracy consolidation. Speaking at a press conference with foreign minister Dunya Maumoon this afternoon, Toby Cadman, a partner at the law firm, said due process was followed in Nasheed’s trial and that the government has prepared its defence. Following the government’s announcement that it has enlisted Omnia Strategy earlier this month, Nasheed’s Maldivian Democratic Party (MDP) expressed “disgust” with the law firm’s decision to represent President Abdulla Yameen’s administration. Omnia Strategy also advises the governments of oil-rich Gabon and Kazakhstan. Gabon’s president, Ali Bongo Ondimba, was elected in 2009, after his father who ruled over the country for 42 years died in 2009. “The UN High Commissioner of Human Rights, the UN Special Rapporteur on Judges and Lawyers, India, The US Senate, the European Parliament and Amnesty International and many others have vigorously denounced the abuses to human rights and democracy by Yameen’s regime,” he said. Dunya told the press today that the law firm’s fees and expenses will be revealed when its work is complete.